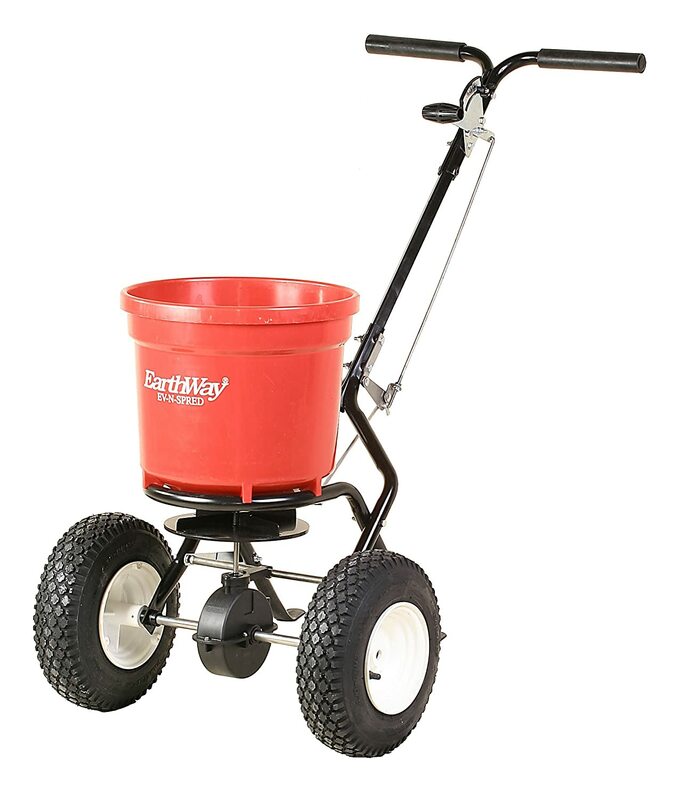 A Broadcast Lawn Spreader is one of those lawn and garden tools that you don’t really think about until you hand spread grass seed or fertilizer, and see first-hand the uneven results. Walk-behind spreaders make the work easier because they support the weight of the fertilizer, seed or ice melt. They also add the safety feature of not having to be as close to chemicals as they are placed. There is a lot of work goes into creating a beautiful lawn. There is filling in holes, picking up rocks, clearing debris from nearby trees. There is seeding, fertilizing and watering – right along with cutting the grass. A lawn spreader can make a difference in the work that you put in maintaining your lawn. 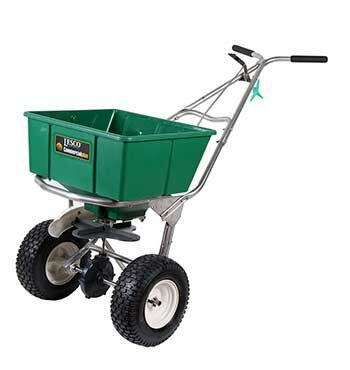 If you have ever walked around a large lawn with a bag of fertilizer or a bag of seed slung over one shoulder, the value of a spreader will quickly become clear to you. The bag is heavy, the seeds are often prickly, and fertilizer tends to be smelly – whether it is chemical or organic. 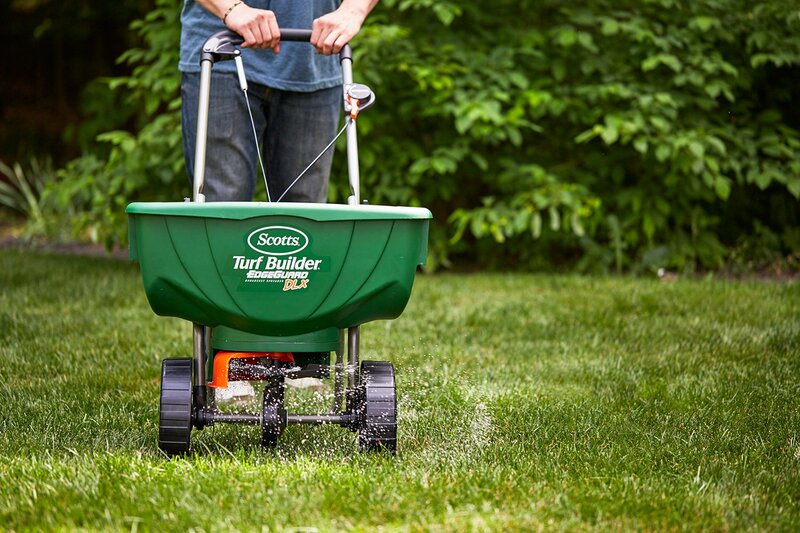 A lawn spreader can make a huge difference for you. Spreaders can save money for you, as well as your back, because they distribute the seeds or chemicals evenly. This makes it easier to follow package guidelines on how much should be applied over a given amount of ground – something that can be somewhat difficult when hand applying the substances. Hand sowing was once the only way to spread seeds. There is a skill to broadcast sowing of seeds by hand. Those who are new to the practice often discover that their plants grow in arcs, with heavy lines at the apex of their strewn seeds, and with more sparse areas trailing behind them. From the way this model is walking, with her eyes focused on the far horizon, it is pretty clear that this field is going to be unevenly sown. Fertilizer was more commonly spread using a shovel, and it was then moved about using a rake or a harrow. It would be moved to the fields using a wagon or cart. When granulated pellets of fertilizer became popular, it was also often spread by hand – much like the seeds. This created a new problem: chemicals that could be absorbed through the skin into the bloodstream of the user – to say nothing of inhaling the dust from the fertilizer. Farmers are among the people who learn about hard work early and understand how machinery can lighten the load. Manure spreaders were among the earliest examples of a mechanical field spreader. Inventions such as the pulverizer, pictured above, meant that one man could easily spread a pile of manure and straw out on the fields without all the starting and stopping that would be necessary with a cart. Eliminating the stopping and starting, alone, meant increased production. Increased production meant more money – sometimes. Over production of the wrong product could sometimes mean low prices or a limited market, but that is a story for another time and place. The bottom line was that machinery meant the ability to put more acres into production without increasing hours of labor. With the coming of the steam age, other farm inventions took up the load. While a farmer would still have to spend many hours in the field fertilizing, planting and harvesting, these inventions sped up the process and opened doors to greater profits. Notice the disc and hoe grain and fertilizer drill in the lower right-hand corner of this picture. A disc/drill combination meant that the farmer could fill the hopper with grain or fertilizer – even a combination – and be able to make one pass across a field instead of two or three. It also meant that he would not have to hire workers or press family members into labor required to both till and cover the grain sown. But farm machinery doesn’t work for everyone – especially not the large models that need to be pulled by animals or tractors. Hand spreaders, such as the one being used by the Indian woman in the picture above, at least began to take some of the guess work out of how to spread seed evenly. Of course, it should be noted, that some workers became very skilled at hand-broadcasting substances. But the small hand spreaders began to remove the load. However, they had a disadvantage: they had to be carried. The worker was still burdened with a bag or a sack. If chemicals were being spread, they were still close to the person doing the job. The logical next step was to put wheels under those hand spreaders and to make the action of the wheels or even a small motor govern the broadcast action. These spreaders did several things for the home gardener or home owner: it placed the hopper full of fertilizer or ice melt well away from the user’s face and hands. It spread the substances neatly, so that a lawn didn’t wind up with clumps of grass or fertilizer. And it took the weight off the worker’s back, and balanced it over two wheels. These carts are sufficiently versatile to be used in commercial settings, as well. Golf courses, parks, and even hotels with green space can benefit from use of these small push carts. There are, of course, larger models in used today. Some of them are suitable for being pulled behind a riding lawn mower or a lawn and garden tractor. Large models are employed in agribusiness. But it is the walk-behind lawn and garden spreader that is often of greatest interest to home-owners. 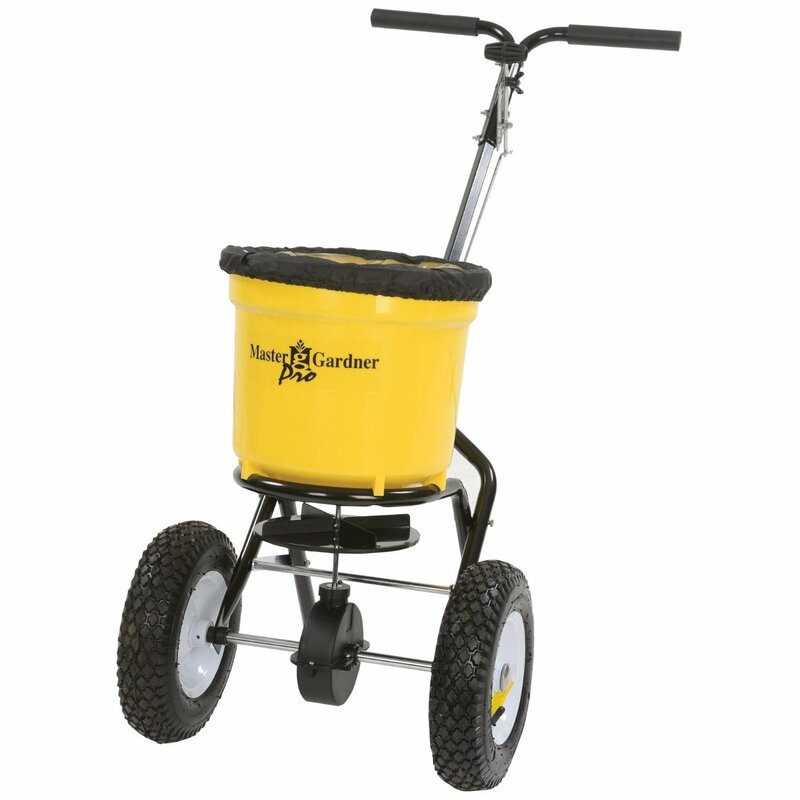 Walk-behind lawn and garden spreaders are most often used to spread fertilizer, seed, and other lawn enhancing chemicals. Those of us who are dedicated organic gardeners might not think well of that last capability, but it is there. It is part of the package. Even distribution of these things helps keep them down to an appropriate level, and avoids excessive application. If you have even a small walk in an area where winter snow is common, you know the difficulty behind getting a smooth spread of ice melt on your side walk. It is easy to understand the difference between skittering along carefully trying not to fall down on the ice while scattering snow melt by hand or pushing your spreader cart ahead of you and walking where the little pellets of snow melt are already creating traction. A spreader can also be a wintertime money saver because it will create an even distribution of the salts or chemicals. The Scotts Turf Builder with edge guard gives the user the ability to block broadcast to the right. This means better control over where the substance being used will land. The Turf Builder can handle fertilizer, seed and ice melt. Some users note that the broadcast substance can build up in the left tire well, and that this can cause clumps to drop off. With some substances, this can create burning. One user recommended removing the wheel and inserting a pie tin to use as a deflector to prevent buildup. The Turf Builder comes assembled, and is light weight, making it easy to handle. However, some users found that if the hopper is filled to capacity, the spreader door has difficulty opening. The Earthway comes needing some assembly. The instructions are somewhat complex, so read them carefully. Once assembled, users seem pleased with this product. It handles any sort of broadcast product. Its inflatable tires handle all sorts of terrain. Tall users are exceptionally pleased with the adjustable handle, which allows them to stand up straight. The Master Gardner broadcast spreader is made in China. It comes needing some assembly. One user recommended using the YouTube video for assembly, as the directions leave something to be desired. The handle is adjustable, which makes it a good choice for tall users. The wheels are inflated, making it easy to maneuver on most terrains. It comes with a rain cover for the storage bucket. The Lesco High Wheel spreader is designed with large expanses of green, such as a golf course, in mind. It is adaptable to fertilizer, grass seed and to snow melt – as needed. The tall, inflated wheels make it maneuverable over most sorts of terrain. It has a rugged steel frame and sturdy construction. 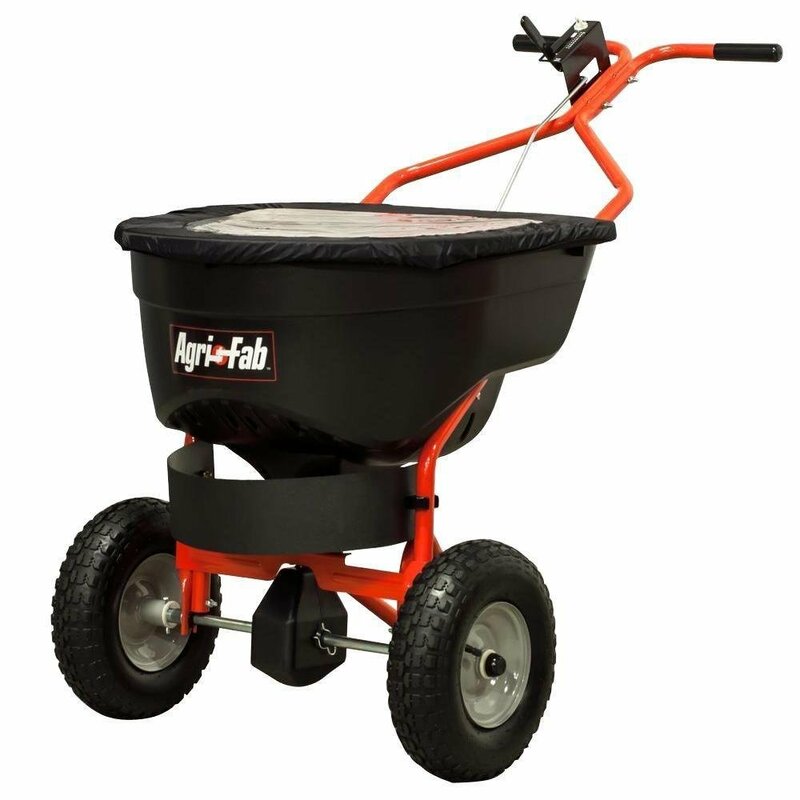 The Agri-Fab Broadcast Spreader is an all-purpose machine that can handles everything from fertilizer to ice melt. It can handle irregular terrain, thanks to its large, inflatable tires. It has a flow control, a covered hopper and a spread shield. The primary difficulty reported by users was that the instructions for assembly are pictures only – no words. Advise to new users is to sit down in a comfortable location, lay out all the parts, and work through the instructions carefully. Otherwise, it seems to be an excellent machine that does the job it was designed to do. My pick of this line up is the Earthway. Although it comes without a rain guard or cover, and it does not have an edge control, it is tough and sturdy. It is manageable in most terrains, and it has an adjustable handle for user comfort. It can handle all sorts of material, and it doesn’t have a lot of complicated parts that can go wrong during operation. With that said, any of these five machines will help lighten the load when it comes to spreading fertilizer, grass seed and even snow melt – depending on the season. That, after all, is what using a spreader is all about – lightening the load, and making the work quality better.